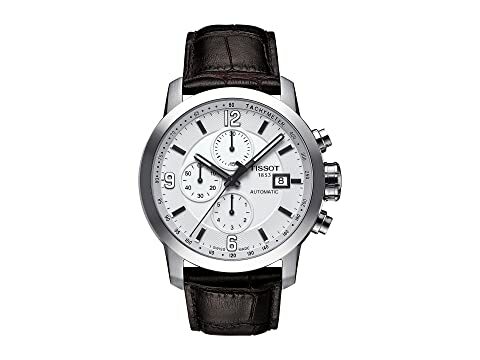 Complement your active lifestyle with the performance-minded magnificence of the Tissot® PRC 200 Automatic Chronograph watch. Adjustable alligator-embossed brown leather strap. Luminous three-hand analog display with Swiss Tissot automatic movement (power reserve of 45 hours), three sub-dials, and date display window. Chronograph functionality (30-minute counter, 6-hour counter, central 60-second chronograph hand). White dial face features Arabic and stick indexes with a minute track at dial perimeter. Water resistant 20 ATM/200 meters.